Heinrich Hetzel was born circa December 1859 at Wisconsin. He was the son of Peter Hetzel and Emelie (?). [S248] U.S. Federal Census 1860 U.S. Federal Census, by Ancestry.com, Page 156. Dwelling 1243. Name Variation Marie Pentner was also known as Mary C.
Name Variation Marie Pentner was also known as Retner. Name Variation Marie Pentner was also known as Beutner. Name Variation Marie Pentner was also known as Rottner. Name Variation Marie Pentner was also known as Marie. Married Name circa 1864 As of circa 1864,her married name was Beuthien. Married Name circa 1864 As of circa 1864,her married name was Beuthen. Marie Pentner was born in December 1840 at Germany. She married Johann Friedrich Beuthen, son of John Beuthen, circa 1864. Marie Pentner died after June 1900. Marie Pentner and Johann Friedrich Beuthen immigrated in 1884. Name from husband's death certificate (reported by her). Louise A. M. Beuthien was born in August 1882 at Germany. She was the daughter of Johann Friedrich Beuthen and Marie Pentner. Louise A. M. Beuthien immigrated with Johann Friedrich Beuthen and Marie Pentner in 1884. Louise A. M. Beuthien was a dressmaker at a shop in 1910. [S244] U.S. Federal Census 1910 U.S. Federal Census, by Ancestry.com, ED52. Dwelling 15. Name Variation Ferdinand Schulenberg was also known as Frederick Schulenburg. Ferdinand Schulenberg was born on 8 January 1860 at Germany. He married Kate (?) on 19 June 1880. Ferdinand Schulenberg immigrated in 1872. On 19 June 1930 Picture of Ferdinand Schulenberg family, Cross Plains, taken on the 50th golden wedding anniversary 19 Jun 1930. Published 12 Oct 1930 The Capital Times. [S245] U.S. Federal Census 1900 U.S. Federal Census, by Ancestry.com, ED40. Dwelling 15. Married Name 19 June 1880 As of 19 June 1880,her married name was Schulenburg. Married Name 19 June 1880 As of 19 June 1880,her married name was Schulenberg. Kate (?) was born on 19 June 1859 at Cross Plains, Dane, Wisconsin, also reported as June 1860. She married Ferdinand Schulenberg on 19 June 1880. Kate (?) had 9 with 8 living in 1900 children. 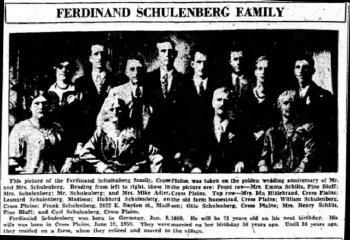 On 19 June 1930 Picture of Ferdinand Schulenberg family, Cross Plains, taken on the 50th golden wedding anniversary 19 Jun 1930. Published 12 Oct 1930 The Capital Times. Married Name Her married name was Adler. Marie Schulenburg married Mike Adler. Marie Schulenburg was born in November 1882 at Wisconsin. She was the daughter of Ferdinand Schulenberg and Kate (?). On 19 June 1930 Picture of Ferdinand Schulenberg family, Cross Plains, taken on the 50th golden wedding anniversary 19 Jun 1930. Published 12 Oct 1930 The Capital Times. William Schulenburg was born in October 1885 at Wisconsin. He was the son of Ferdinand Schulenberg and Kate (?). Married Name Her married name was Schlitz. Emma Schulenburg married (?) Schlitz. Emma Schulenburg was born in January 1888 at Wisconsin. Name Variation Hubert Schulenburg was also known as Hubbard. Hubert Schulenburg married Catherine Laufenberg. Hubert Schulenburg was born in March 1893 at Wisconsin. Hubert Schulenburg died on 13 November 1981 at age 88. Married Name Her married name was Hildebrand. Ida Schulenburg married (?) Hildebrand. Ida Schulenburg was born in November 1896 at Wisconsin. Frank Schulenburg was born in January 1900 at Wisconsin. Name Variation Henry W. Steckelberg was also known as H. W.
Name Variation Henry W. Steckelberg was also known as Henry E.
Henry W. Steckelberg was born on 15 February 1876 at Sauk, Wisconsin. He was the son of Henry Steckelberg and Catherine Meyer. Henry W. Steckelberg married Anna Schuette, daughter of Johann Juergen Wilhelm Schuette and Dorothea Reinecke, in 1901. Henry W. Steckelberg married Mathilda Louise Caroline Hamburg circa 1918. 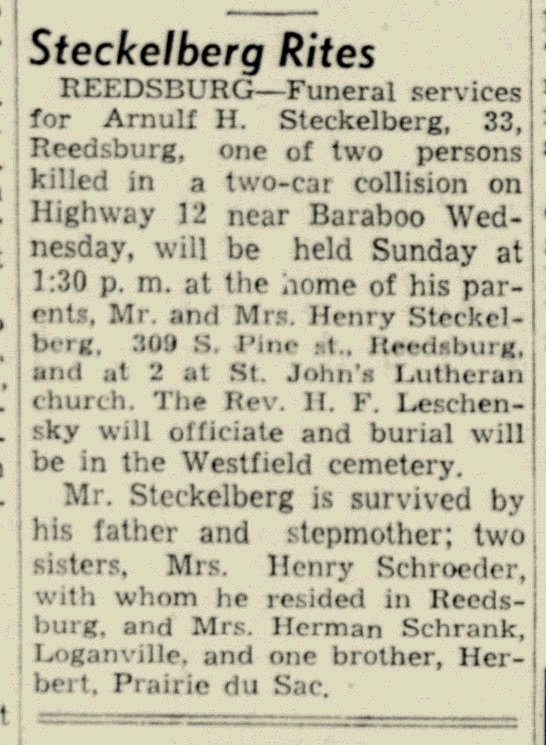 Henry W. Steckelberg died on 30 November 1947 at Reedsburg, Sauk, Wisconsin, at age 71. On 6 August 1922 at Schuette family reunion. [S246] U.S. Federal Census 1880 U.S. Federal Census, by Ancestry.com, ED265. Page 13. Dwelling 112. [S245] U.S. Federal Census 1900 U.S. Federal Census, by Ancestry.com, ED149. Dwelling 111. [S364] Wisconsin State Census Wisconsin State Censuses, 1895 and 1905, by Ancestry.com, Dwelling 103. [S244] U.S. Federal Census 1910 U.S. Federal Census, by Ancestry.com, ED130. Dwelling 154. [S243] U.S. Federal Census 1920 U.S. Federal Census, by Ancestry.com, ED171. Dwelling 245. [S250] U.S. Federal Census 1930 U.S. Federal Census, by Ancestry.com, ED29. Dwelling 4. Name Variation Anna Schuette was also known as Annie. Married Name 1901 As of 1901,her married name was Steckelberg. Anna Schuette was born on 3 July 1879 at Wisconsin. She was the daughter of Johann Juergen Wilhelm Schuette and Dorothea Reinecke. 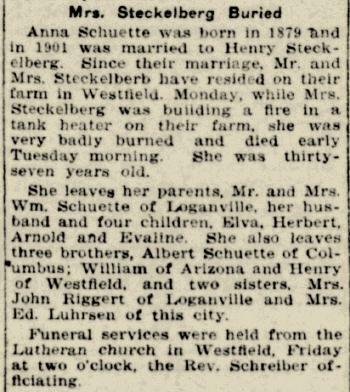 Anna Schuette married Henry W. Steckelberg, son of Henry Steckelberg and Catherine Meyer, in 1901. 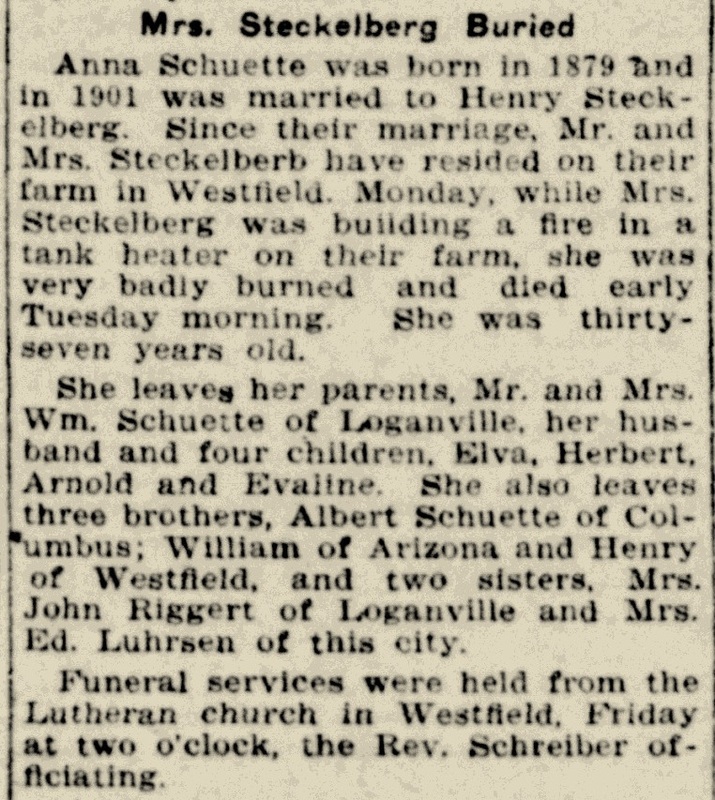 Anna Schuette died on 13 February 1917 at age 37 Anna (Schuette) Steckelberg obituary; also reported as 1916. Anna Schuette had 2 with 2 living in 1910 children. On 6 August 1922 at Schuette family reunion. [S246] U.S. Federal Census 1880 U.S. Federal Census, by Ancestry.com, NA Film Number T9-1446 Page Number 283B. Herbert Steckelberg married Dorothy Gruber, daughter of Christian D. Gruber and Katherine M. Stelter. Herbert Steckelberg was born on 6 March 1906 at Wisconsin. He was the son of Henry W. Steckelberg and Anna Schuette. Herbert Steckelberg died in October 1987 at age 81. Herbert Steckelberg obtained US Social Security Card at Wisconsin; last residence Prairie Du Sac, Sauk, Wisconsin. Name Variation Arnulf H. Steckelberg was also known as Arnold. Arnulf H. Steckelberg was born in 1911 at Wisconsin. 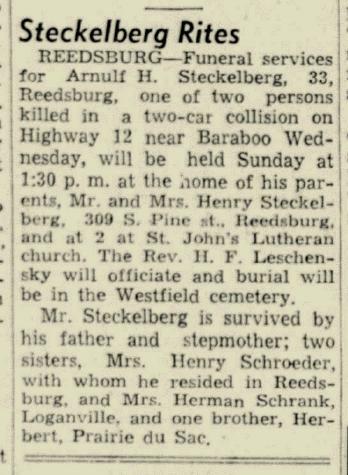 Arnulf H. Steckelberg died on 27 December 1944 at in a car accident, Baraboo, Sauk, Wisconsin, Arnulf Steckelberg obituary. Name Variation Evelyn E. Steckelberg was also known as Evaline. Married Name 9 November 1935 As of 9 November 1935,her married name was Schroeder. Evelyn E. Steckelberg was born on 9 April 1915 at Sauk, Wisconsin. She was the daughter of Henry W. Steckelberg and Anna Schuette. Evelyn E. Steckelberg married Henry Ewald Schroeder on 9 November 1935 at St John Lutheran Church, Reedsburg, Sauk, Wisconsin. Evelyn E. Steckelberg died on 3 May 2005 at age 90 Schroeder, Evelyn E. SHIPPENSBURG, PA. - Evelyn E. Schroeder, age 90, of Shippensburg, Pa. (formerly of Prairie du Sac), died at the Shook Home, Chambersburg, Pa., on Tuesday, May 3, 2005. Evelyn Schroeder was born on April 9, 1915, near Loganville. Her parents were the late Henry E. and Anna (Schuette) Steckelberg. Henry E. Schroeder, husband for 65 years, preceded her in death in 2000. Evelyn and Henry operated a retail business in Prairie du Sac and Sauk City for many years, followed by employment at the University of Wisconsin Hospital, Madison, until retirement. They moved to Shippensburg, Pa., in 1984, where they became members of Memorial Lutheran Church. Evelyn greatly enjoyed needlework, baking, gardening, music and travel. Her children, grandchildren and great-grandchildren gave her much joy. She is survived by two sons, Thomas (Joan) Schroeder and Mark (Clara) Schroeder, both of Shippensburg, Pa; a daughter, Joanne Tweedy of Arcadia, Calif; sister-in-law, Dorothea Steckelberg of Prairie du Sac; five grandchildren, Gretchen (Mark) Hennigan of Bridgeport, W.Va., Erik (Jennifer) Schroeder of Mechanicsburg, Pa., Derek Schroeder of Harrisburg, Pa., Amanda Schroeder of Shippensburg, Pa., and Jennifer Tweedy of Arcadia, Calif; and three great-grandchildren, Alex and Katie Hennigan of Bridgeport, W.Va., and Zachary Schroeder of Mechanicsburg, Pa. She was also preceded in death by a sister, Elva Schrank of Loganville; and two brothers, Herbert Steckelberg of Prairie du Sac, and Arnulf Steckelberg of Reedsburg. A memorial service for Evelyn will be held on Saturday, June 18, 2005, at ZION LUTHERAN CHURCH, Loganville (Westfield Township), where she will join her husband in interment. Memorial contributions may be made to Zion Lutheran Church or the Memorial Lutheran Church Building Fund, 34 E. Orange St., Shippensburg, PA 17257. Arrangements are under the direction of Auer Memorial Home & Cremation Services, Inc., Harrisburg, Pa.
Henry Ewald Schroeder was born circa 1911 at Wisconsin. He married Evelyn E. Steckelberg, daughter of Henry W. Steckelberg and Anna Schuette, on 9 November 1935 at St John Lutheran Church, Reedsburg, Sauk, Wisconsin. Henry Ewald Schroeder died in 2000. Name Variation Mathilda Louise Caroline Hamburg was also known as Matilda. Married Name circa 1918 As of circa 1918,her married name was Steckelberg. Mathilda Louise Caroline Hamburg was born on 1 November 1880 at Wisconsin. She married Henry W. Steckelberg, son of Henry Steckelberg and Catherine Meyer, circa 1918. Mathilda Louise Caroline Hamburg died on 13 November 1960 at age 80 Mrs Henry Steckelberg (Mathilda Hamburg) obituary. Married Name circa 1898 As of circa 1898,her married name was Leicht. Married Name circa 1898 As of circa 1898,her married name was Licht. Ida Steckelberg was born in February 1880 at Wisconsin. She was the daughter of Henry Steckelberg and Catherine Meyer. Ida Steckelberg married Herman M. Licht circa 1898. Ida Steckelberg died in 1973. Ida Steckelberg had 1 with 1 living in 1900 children. She had 3 with 3 living in 1910 children. [S245] U.S. Federal Census 1900 U.S. Federal Census, by Ancestry.com, Year: 1900; Census Place: Westfield, Sauk, Wisconsin; Roll: 1817; Page: 2B; Enumeration District: 0149; FHL microfilm: 1241817. [S244] U.S. Federal Census 1910 U.S. Federal Census, by Ancestry.com, Year: 1910; Census Place: Westfield, Sauk, Wisconsin; Roll: T624_1737; Page: 8A; Enumeration District: 0130; FHL microfilm: 1375750. [S243] U.S. Federal Census 1920 U.S. Federal Census, by Ancestry.com, Year: 1920; Census Place: Westfield, Sauk, Wisconsin; Roll: T625_2015; Page: 5A; Enumeration District: 171; Image: 272. [S250] U.S. Federal Census 1930 U.S. Federal Census, by Ancestry.com, Year: 1930; Census Place: Westfield, Sauk, Wisconsin; Roll: 2609; Page: 2B; Enumeration District: 39; Image: 519.0; FHL microfilm: 2342343. [S373] U.S. Federal Census 1940 U.S. Federal Census, by Ancestry.com, Year: 1940; Census Place: Baraboo, Sauk, Wisconsin; Roll: T627_4523; Page: 1B; Enumeration District: 56-8. Rosella Steckelberg was born in June 1898 at Wisconsin. Rosella Steckelberg died before 1917. George Meyer married Maria (?). George Meyer was born circa 1824 at Hanover, Germany. Name Variation Maria (?) was also known as Catherine (?). Married Name Her married name was Meyer. Maria (?) married George Meyer. Maria (?) was born circa 1840 at Hanover, Germany. Married Name Her married name was (?) Detman. (?) Meyer was the daughter of George Meyer and Maria (?). (?) Meyer married (?) Detman. (?) Detman married (?) Meyer, daughter of George Meyer and Maria (?). Dora Detman was born circa 1866 at Hanover, Germany. She was the daughter of (?) Detman and (?) Meyer. Ernst Steckelberg died on 17 April 1882. He was born on 17 April 1882. Willie Steckelberg was born on 31 December 1889. Willie Steckelberg died on 27 July 1892 at age 2. Paul Logan married Shirley Jean Baumbach, daughter of Julius Herman Baumbach and Myrtle Sadd, on 5 June 1977. Paul Logan died on 7 April 2005. Francis W. Baumbach was born on 27 June 1915 at Wisconsin. He was the son of William Albert Baumbach and Elizabeth L. Ebert. Francis W. Baumbach died on 12 October 1990 at age 75. Francis W. Baumbach obtained US Social Security Card at Wisconsin. [S243] U.S. Federal Census 1920 U.S. Federal Census, by Ancestry.com, ED150. Dwelling 71. Orville O. Baumbach was born on 20 October 1913 at Wisconsin. He was the son of George Heinrich Baumbach and Gertie A. (?). Orville O. Baumbach died in June 1970 at age 56. Orville O. Baumbach obtained US Social Security Card at Wisconsin; last residence not specified.